A life-long activist, Brown organised the blockade of the dam on Tasmania’s Franklin River in 1982/83 whilst director of the Wilderness Society. He was arrested and spent 19 days in prison. On the day of his release he was elected as the first Green into the Tasmanian Parliament and in 1983 the Franklin was protected. In 1992 he was a driving force in forming the Australian Green Party. He resigned from State Parliament in 1993, was elected to the Senate in 1996 and re-elected in 2001. Robert Hannaford has known Senator Bob Brown for around six years. When the possibility arose for this Archibald entry, Hannaford flew to Brown’s home. He had imagined painting the Senator with the beautiful Tasmania bush in the background. All went well the first day. The weather was lovely and he started directly on the larger canvas with Brown in the shade of the gum trees in his garden. The next morning it was another lovely sunny day. Suddenly there was a huge fire. It was burning season and the wood chippers were fire bombing the bush, having removed trees. Born in 1944, Hannaford lives and works in Riverton, SA. Acclaimed for his portraits, he also paints landscapes and nudes and is a sculptor. His sculpture of Sir Donald Bradman stands outside the Adelaide Oval. 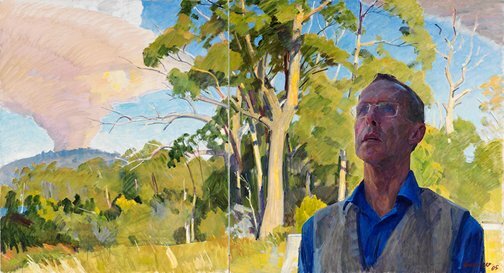 He won the Doug Moran Portrait Prize in 1990 and the Fleurieu Landscape Prize in 1995. He has been an Archibald finalist on 14 previous occasions winning the People’s Choice Award three times.